As you read the title, please yell it in your head like a drunk frat boy in South Padre Island, aka where I spent SPRING BREAK 1997! It was not that exciting, but again, I need it to be yelled. This was our first spring break during elementary school, which meant we really needed it. The boys and I were counting down to this week. The early mornings are brutal, we cannot get our act together. Too many days I have thrown everyone in the car, always, always with James in his PJS and have had to slow down and let Zach roll out of the car in the carpool line while I yell “Love you! Have a good day! 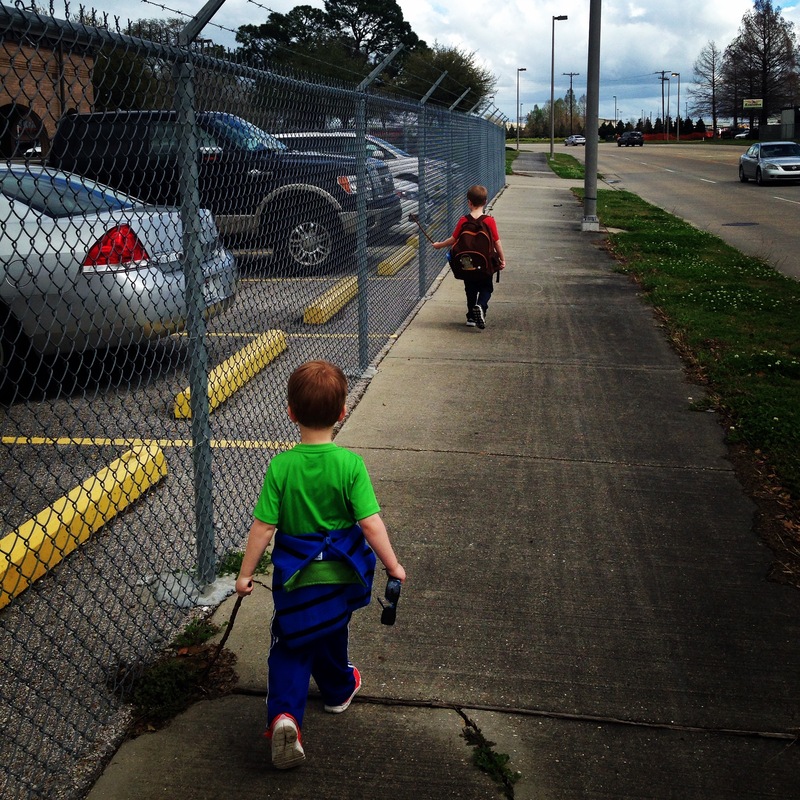 RUN!” so he won’t be tardy. And I don’t work. Embarrassing. We needed a reset. Initially we had no plans, which I was looking forward to/terrified of. 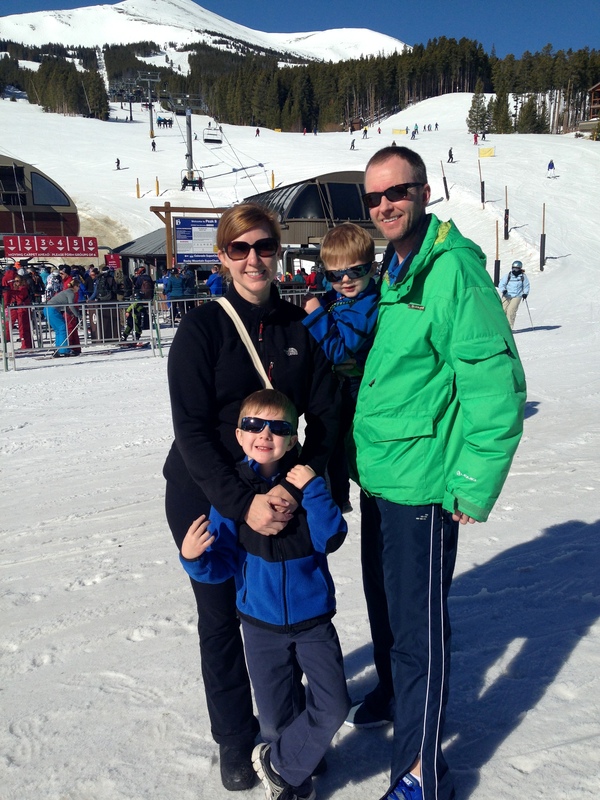 Then our new friends invited us along on their ski trip to Breckenridge with two other families. When you have two extraverts married to each other who have two more extraverts as children, the answer to a multi-family trip is always, “yes” and “how can we make this happen?”. We spent the night at a hotel on the West side of Denver then headed to Breckenridge the next morning. 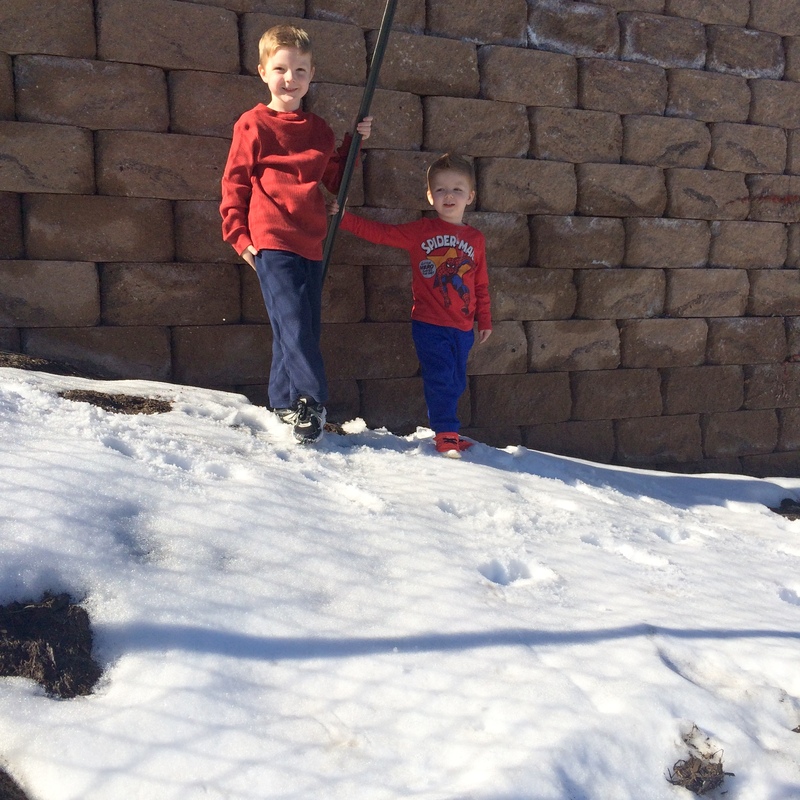 The boys were thrilled to see snow and mountains. They kept yelling “snow!” and “mountains” every 30 seconds. It was super cute, up to a point, obviously. This is their first snow sighting in the parking lot of the hotel. You can tell how warm it was, no one needed a jacket. 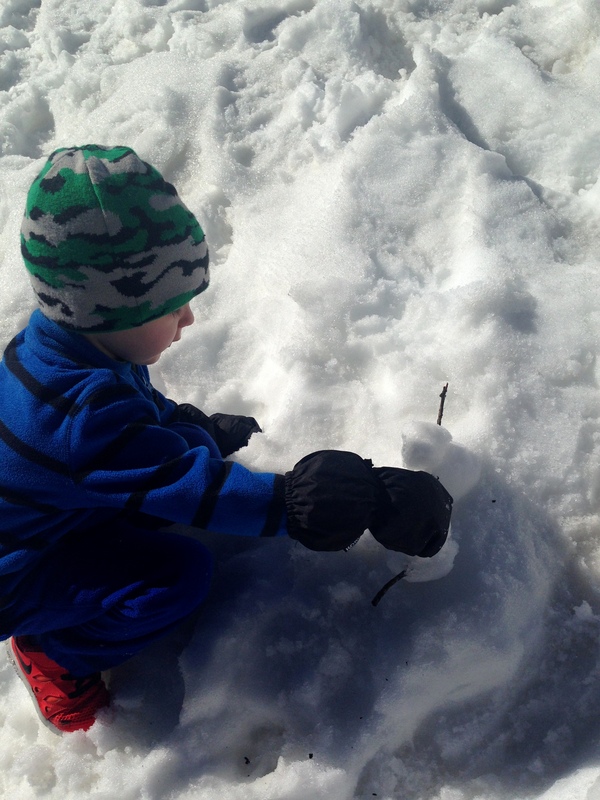 We had to physically remove them from this snow drift with the promise of more. When we stopped at Academy I had to yell “don’t touch the dirty snow!” about 52 times, again, promising there would be much more than the blackened chucks strewn about the parking lot. And Breckenridge did not disappoint. 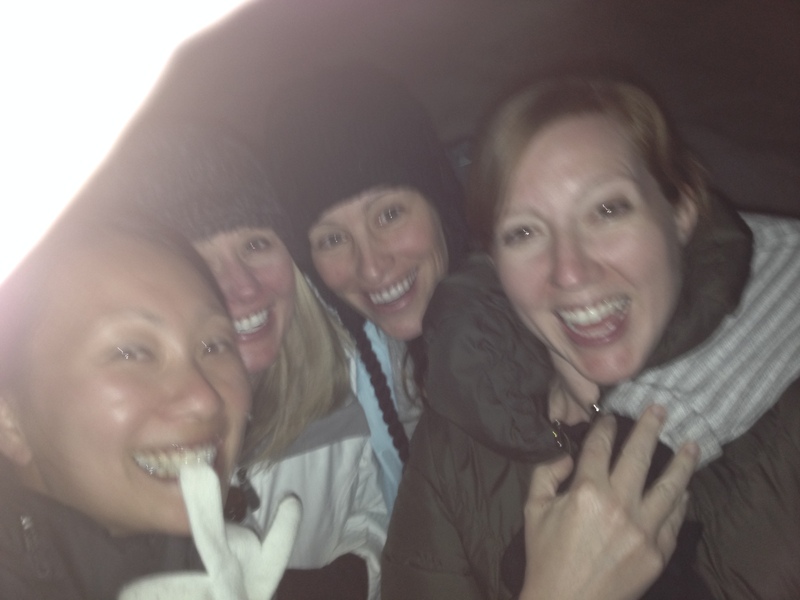 The first thing we did was go toob sledding. And by “we” I mean the boys and Alex. I am way too chicken for that kind of thing. I am still scarred from Zach and Tyler (really Ashley) making me go down the big slide at Splashtown. I am not kidding. James and Alex were the biggest fans of the toobing. 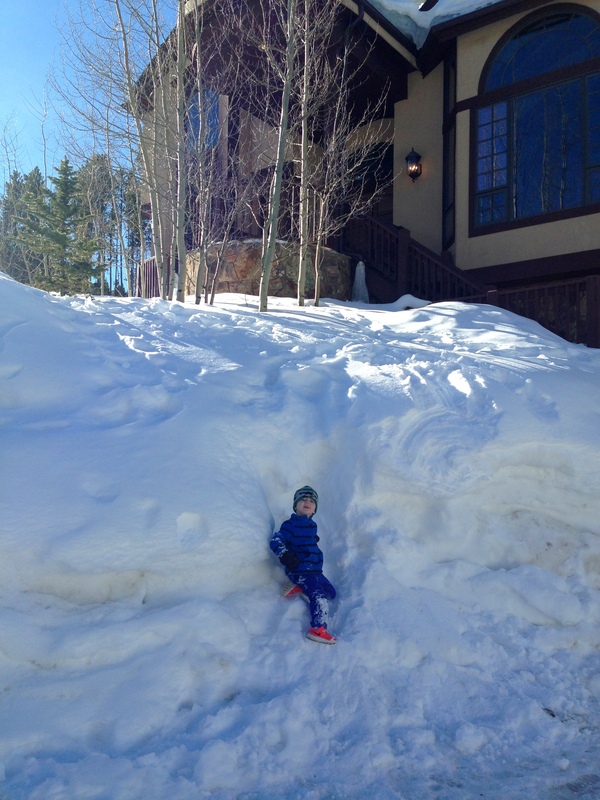 Zach mainly wanted to climb in another snow drift and make a snow angel. We met the two other families and knew immediately we would get along fine. We released our children into the basement with the other eight children and no one batted an eye. Plus there was a baby I wanted to steal (I am coming for you Jennings) and a girl that is basically me in the suburbs (hiya Ash). I would love to tell you more about them, but they maybe don’t know I have a blog and maybe don’t want to share their whole lives with the internet. Maybe. Here we are though, the moms at least, walking home from having a drink at the lodge before we were attacked by the Slope 8 bandits. Just kidding, though Rian thought we were serious. Then it was time to ski! Again, for Alex, Zach and James. Not me. I did that circa 2003 and have no need to do it again. I don’t excel so there is really no point. 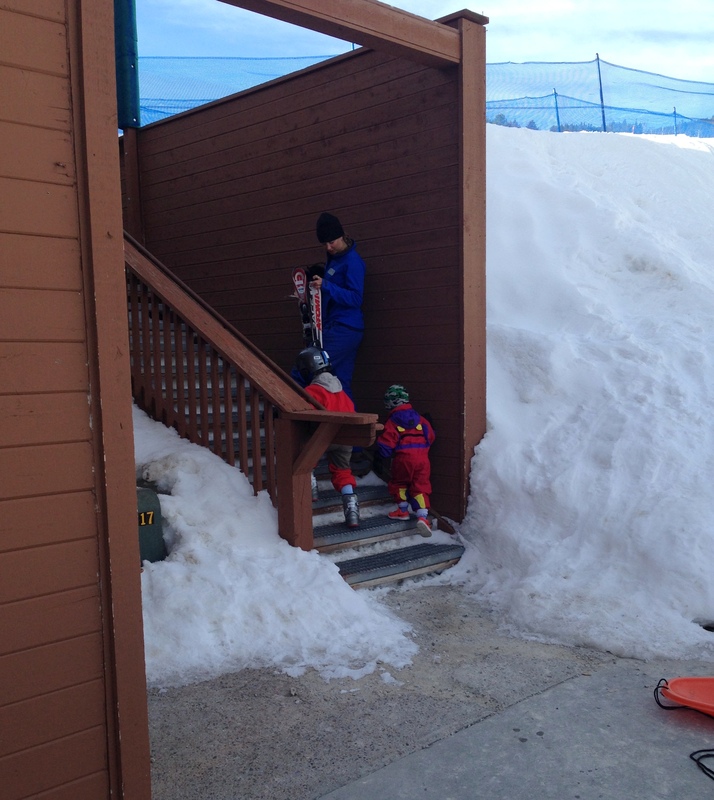 There they go, my boys, up the stairs to ski school! Not pictured is the call I got at 11:00 am, waking me from a nap, to come get James. He was “not happy” and would not put on his ski suit. None of this shocked me. But Alex got there before I did and when he talked to the instructors they asked if James could try snowboarding. I’m sorry, what? Do they make snowboards for someone sub 4 feet? Apparently they do. Oh and he also wanted to snowboard (again, what?) without his ski suit. Like we care. 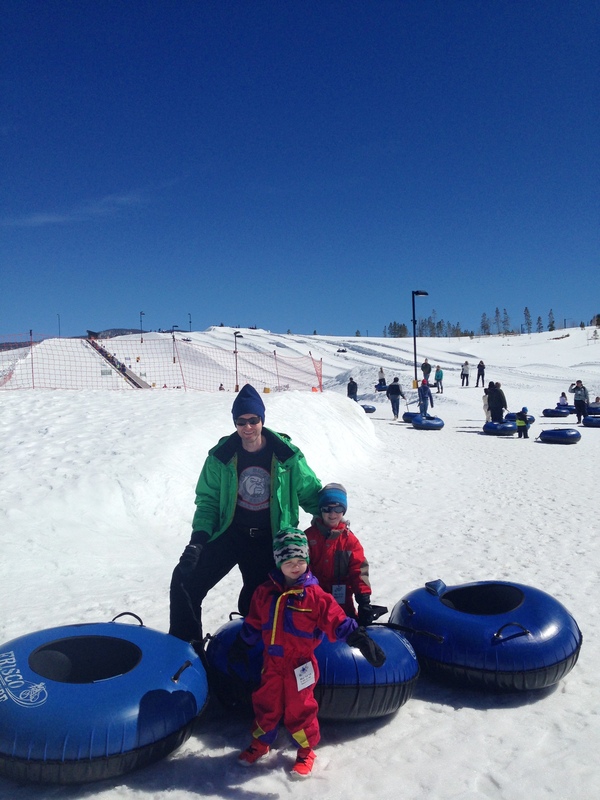 So here he is snowboarding in his long underwear and Sven and Olaf shirt. Naturally. I could look at this photo all day, there is nothing cuter. 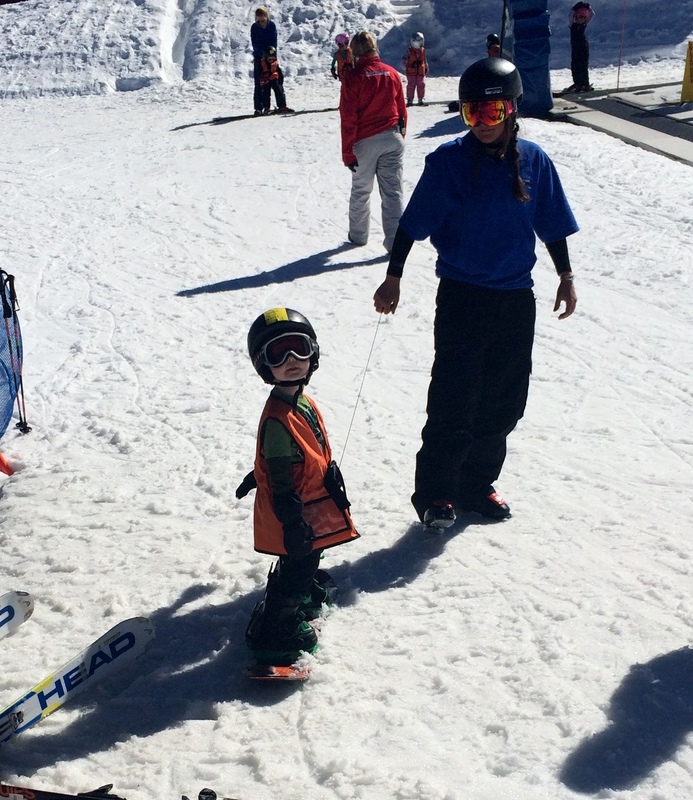 We also have a video of him being directed down the mountain with his coach holding onto the handle on his vest. He is the most depressed snowboarder ever. 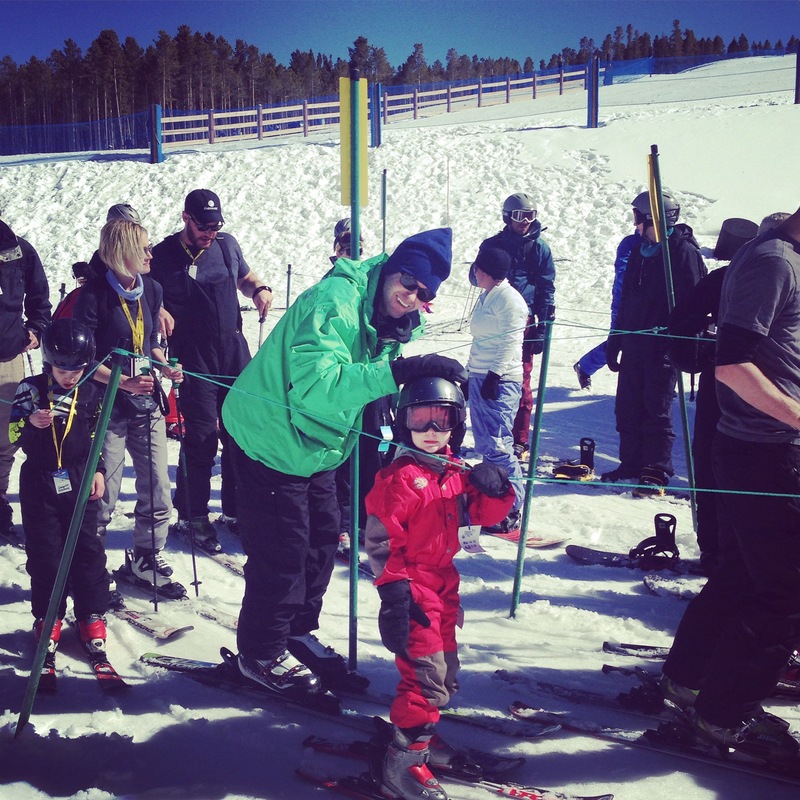 Zach, however liked skiing! He liked his suit (both suits thanks to my friend Linda) and his only complaint was that he could not go fast enough, because he kept falling, and he wanted to use poles. The one catch to Zach skiing…Alex tried to ruin it. I really thought Alex would have learned from his mistakes of 2003. You see, when I was learning to ski, I too went to ski school and did the bunny slopes. And I too, thought I was doing great. Then my boyfriend Alex took me to the top of the mountain to have lunch AND I HAD TO SKI DOWN. IN A BLIZZARD. OR AT LEAST A BUNCH OF SNOW. We almost didn’t make it. As a couple I mean. 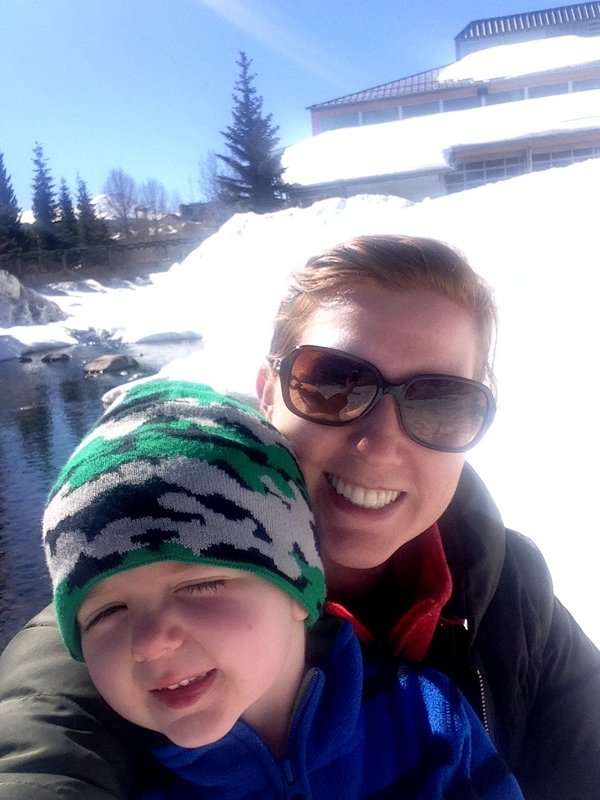 I was crying and yelling at him as I skied horizontally across the mountain, fell over, popped my ski off, turned around and put it back on to do it again, and again and again until I finally scooted down the mountain on my hiney. I like to call that the test of our relationship and I am still slightly shocked we have lasted this long. Just thinking about it makes me angry. So what does this smart, smart man I have since married do to our sweet first born child? THE EXACT SAME THING. Zach had skied on the tiny hill pictured in James’s photo and Alex took him up the lift and down a green. I could have murdered him. Luckily for him, the minute I saw Zach’s teary face Alex started talking really quickly about that being a very poor choice and he should not have done that and how great Zach did. “He did so great! He did so great!” Alex chirped. There was still only murder in my heart. However…Zach is not me and forgets things much quicker, so the next day he got right back at it and by the end was going up the lift and skiing down the green with his dad. The first day was all but forgotten. 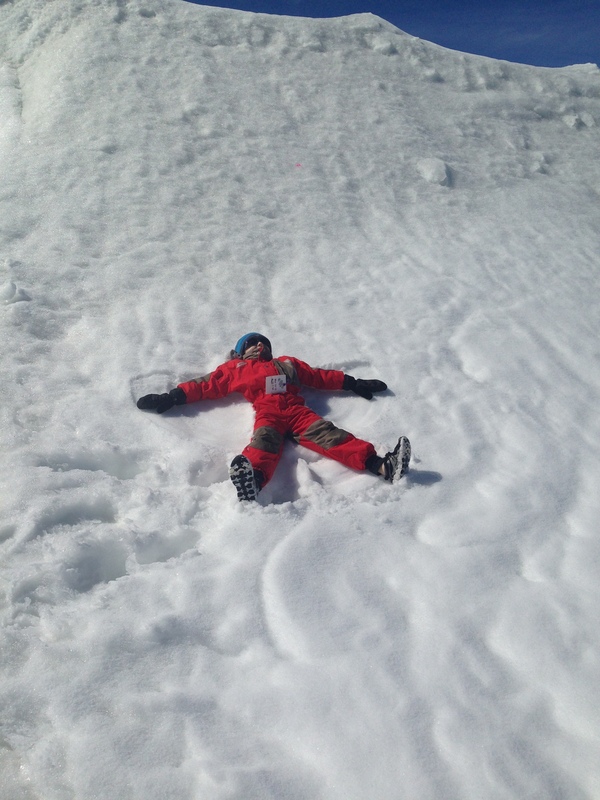 He really ended up liking and wanting to stay more days and ski. That next day when Zach was bouncing right back, James was not. He told me he was not going back snowboarding. No way. 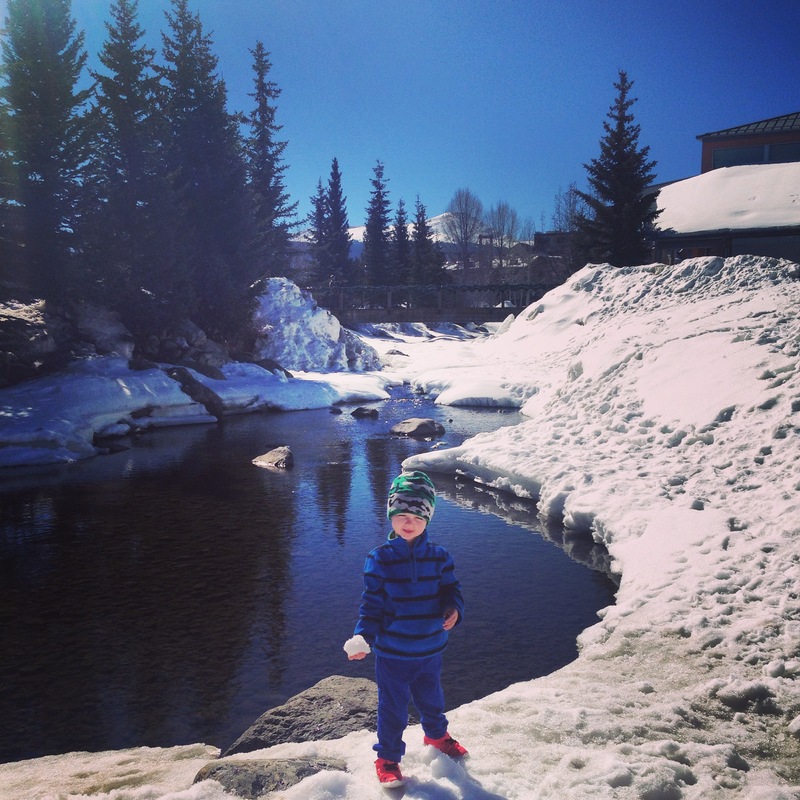 So we hung out around Breckenridge, got coffee, walked on a frozen river and made a tiny snowman. James had a much better day. Especially since he got to go in the hot-tub twice. Once before his non-nap and again with his dad after non-skiing. 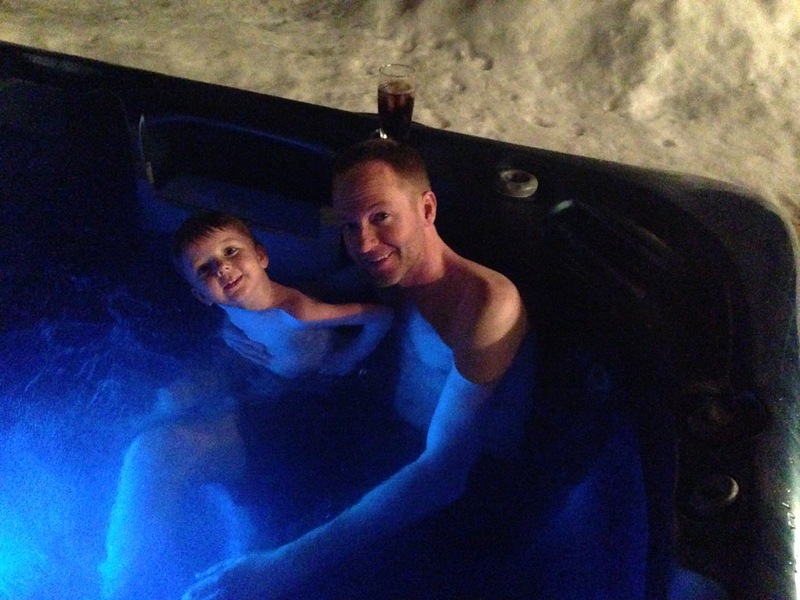 No one loves a hot-tub like James. There was a lot of “whoo hoos!” coming from the tub. All in all it was a great trip. The boys loved, loved all the snow and we all wanted to stay longer. Well, I was sort of ready to get home, only because this kept happening at night. At least we had a king sized bed at the house. 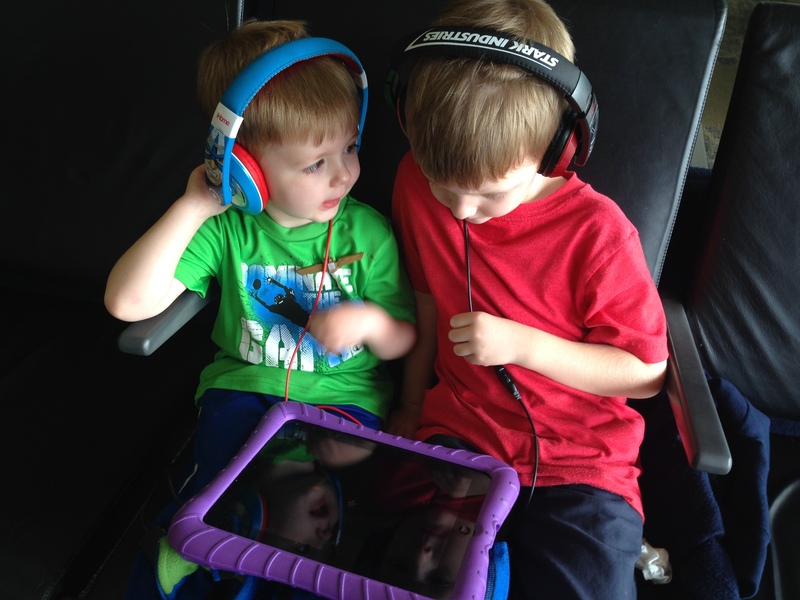 Is this too many sleeping kids photos for one blog? I don’t know my limits. 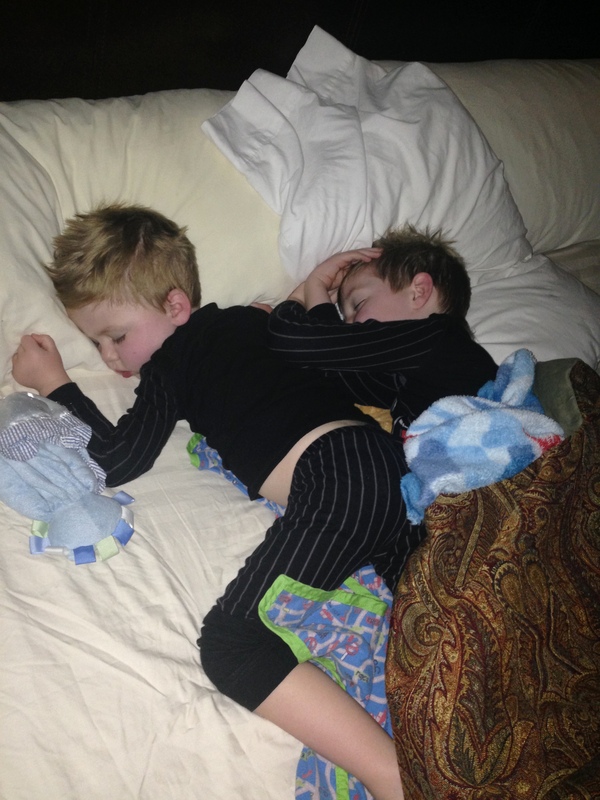 I just know that they still look like their little selves when they are sleeping and I love every second of it. I will try to reign myself in going forward. Anyway, I made us take one family photo before we left and I knew you would all like to see it. The family who wears sunglasses and blue, stays together. Kinsey, this post made me laugh out loud–at my nail place no less. The client across from me kept looking at me and smiling when I’d start laughing. See, you brought joy to a complete stranger! You made my day Sally!! So glad you liked it!